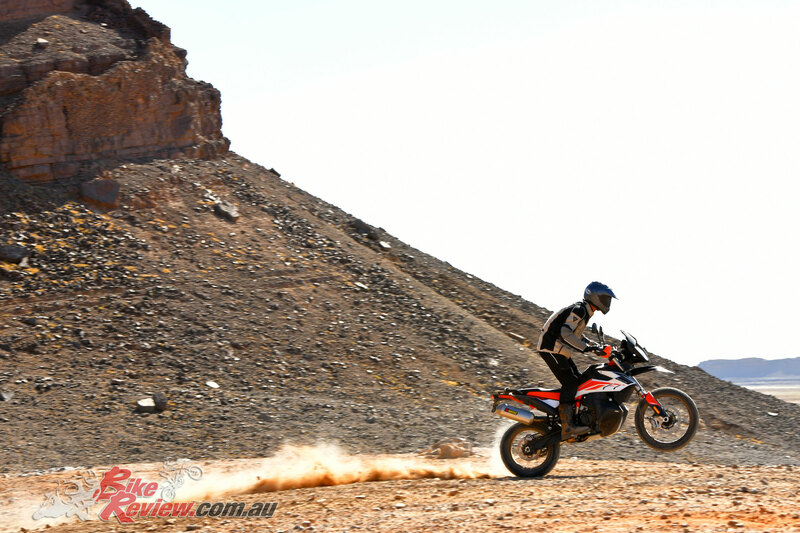 For an anxious moment, the top of the dune looked out of reach. 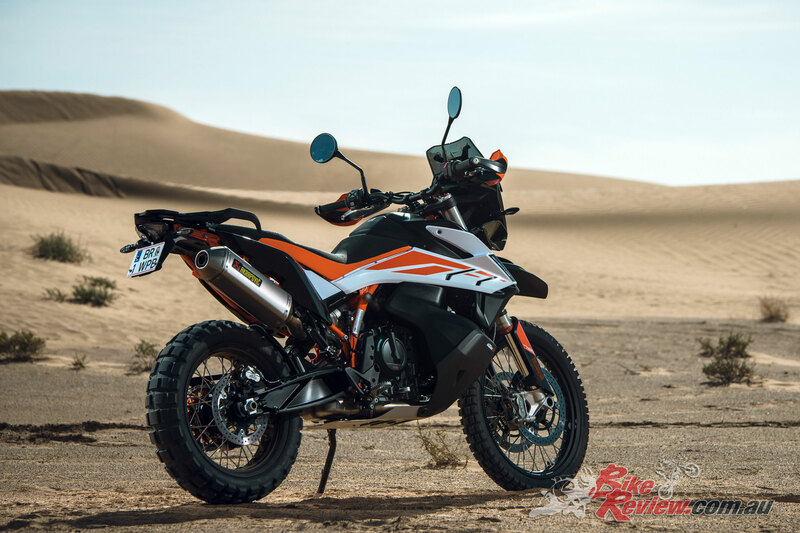 As I climbed the gentle slope in the Moroccan desert, twisting the 790 Adventure R’s throttle slightly wider in an attempt to gain speed, the KTM barely accelerated; its rear tyre instead spinning harder and kicking out an even bigger plume of soft, dry sand. 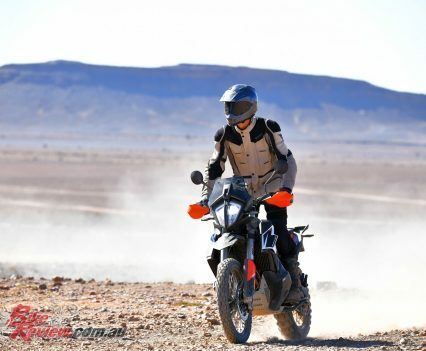 I’d attacked the dune too slowly, and tweaked the throttle too sharply; and I almost paid the price by burying the rear wheel, just as I had ten minutes earlier. 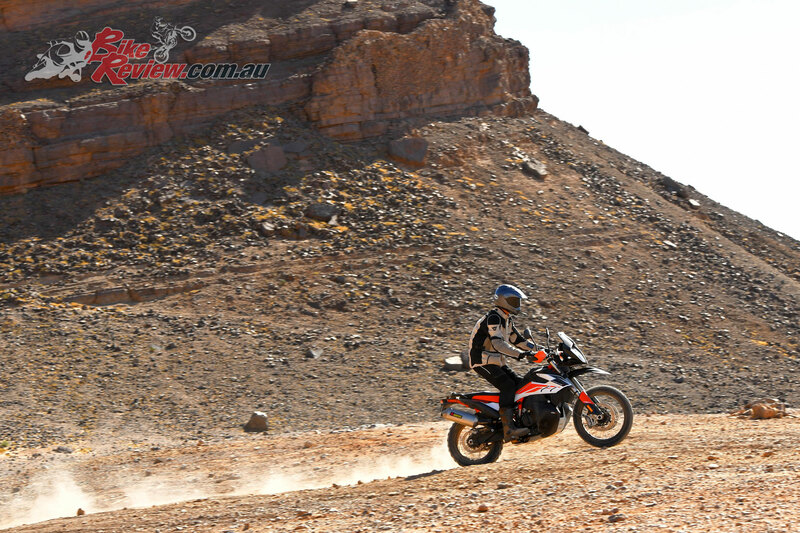 But this time the tyre found just enough grip. 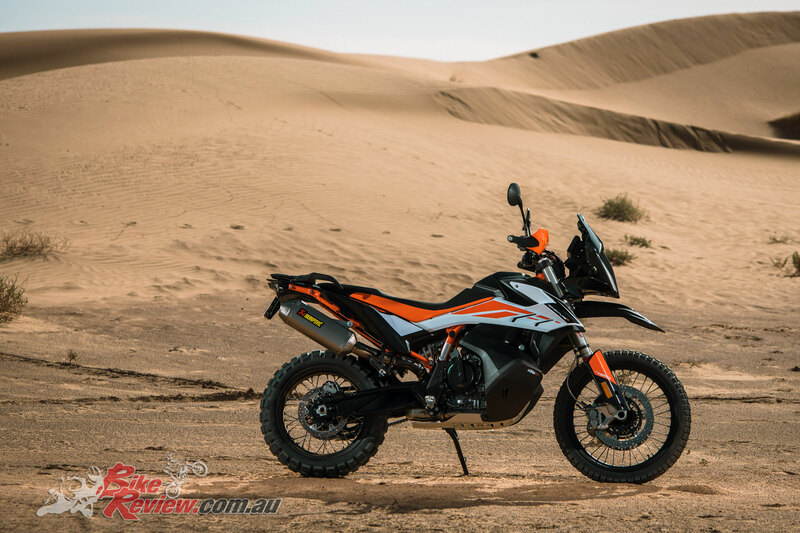 With the help of a quick dab of left boot, I crested the rise, reached firmer sand and kept going, impressed yet again by the 790 Adventure R’s ability to cope with the conditions. 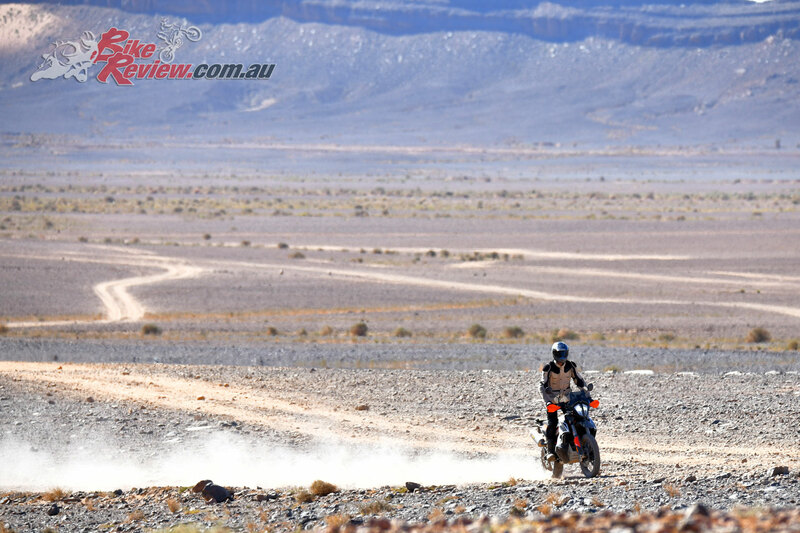 This was my first ever experience of riding over – and occasionally into – sand dunes. 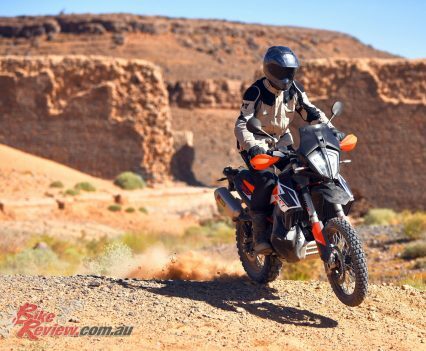 Even adventure bike launches don’t normally include such extreme terrain. 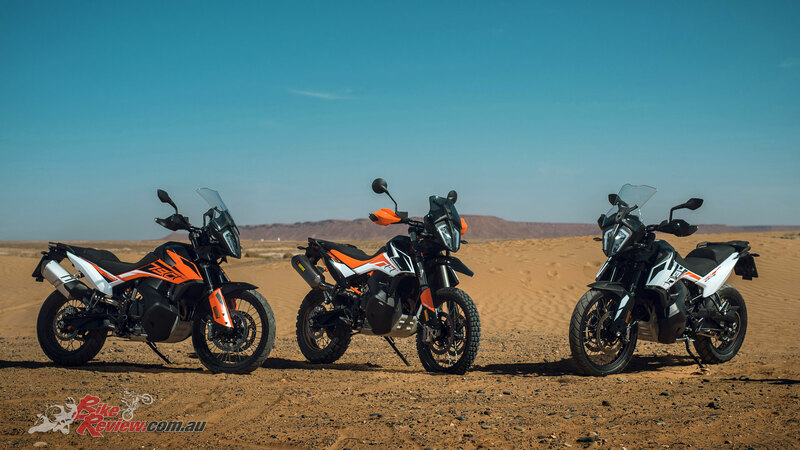 But this landscape was why KTM had come to Erfoud, in south-eastern Morocco near the border with Algeria, to launch the 790 Adventure and Adventure R.
The Austrians aimed to show that their two new parallel twin middleweights are not like existing adventure bikes, and bring new possibilities to the class. 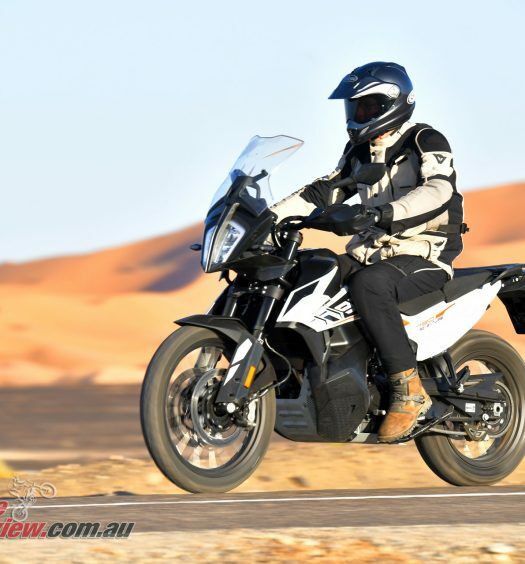 What the new parallel twins are like in many respects is their 790 Duke sibling, whose basic layout of 799cc DOHC eight-valve engine in a tubular steel frame is shared. 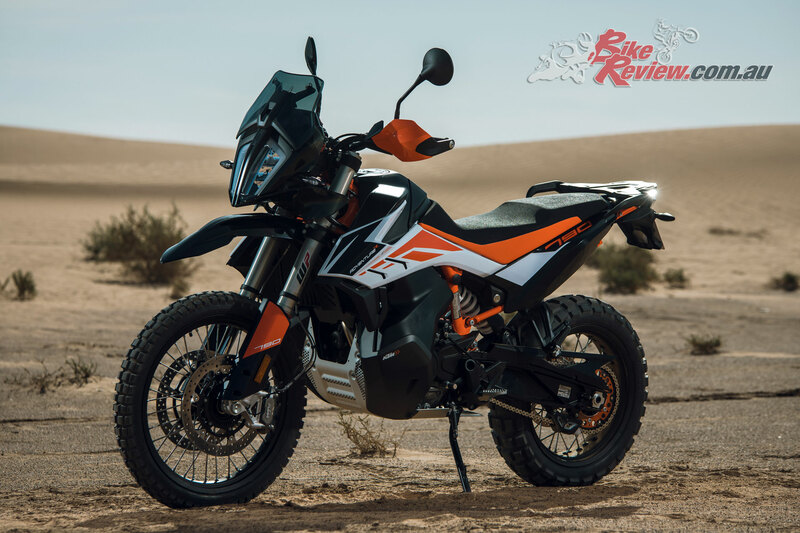 Obvious differences include the Adventure models’ fairing, screen, aluminium bash-plate and bigger radiator; a fuel tank that extends down either side of the engine to hold 20 litres; and long-travel suspension holding wire-spoked wheels, the front a dirt-friendly 21 inches in diameter. 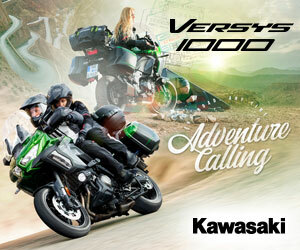 Both Adventure models use an engine that is softened slightly from Duke spec with new camshafts and injection system. 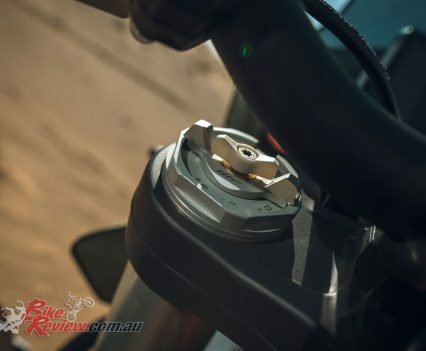 This increases torque slightly below 7500rpm, and reduces it from there to the 10,000rpm limit. 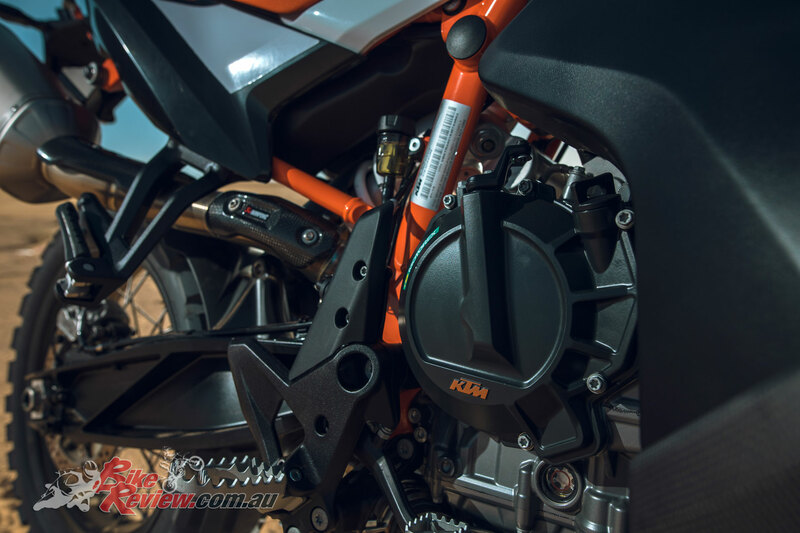 Maximum power output drops by 10bhp to 94bhp at 8000rpm, while the torque peak is slightly higher at 89N.m, and is produced 1400rpm earlier, at 6600rpm. 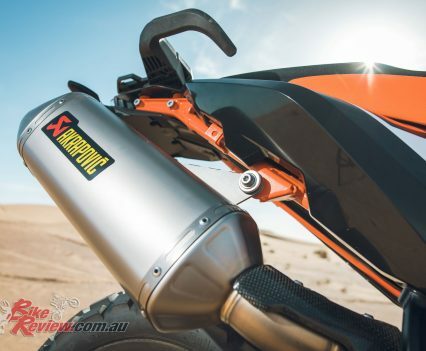 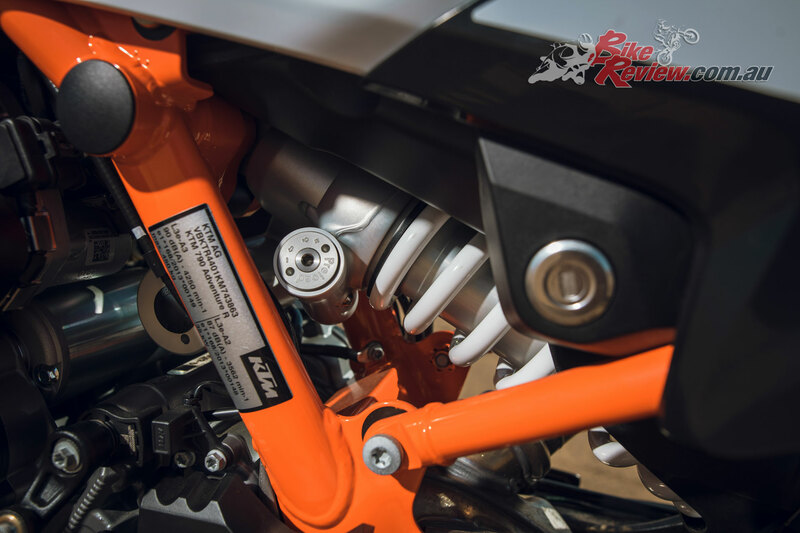 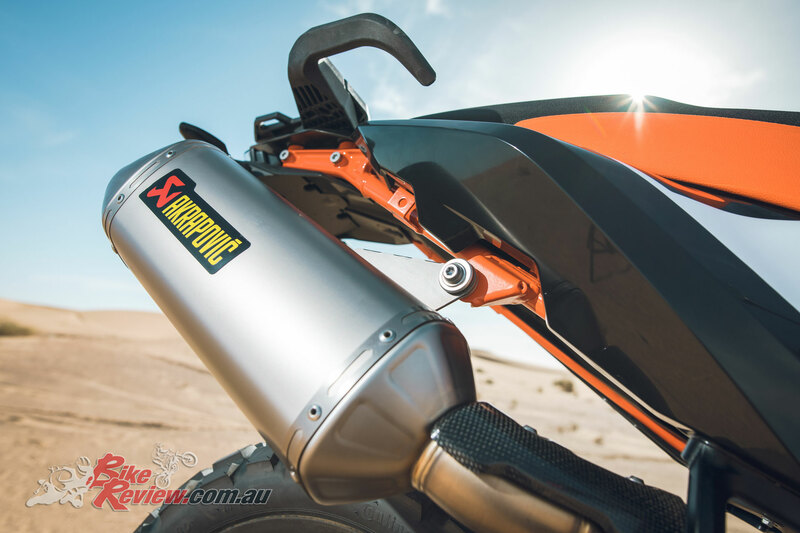 The Adventures’ shared chrome-molybdenum frame (orange in the case of the R) holds a cast aluminium swing-arm, which operates the diagonally mounted rear shock without a linkage. 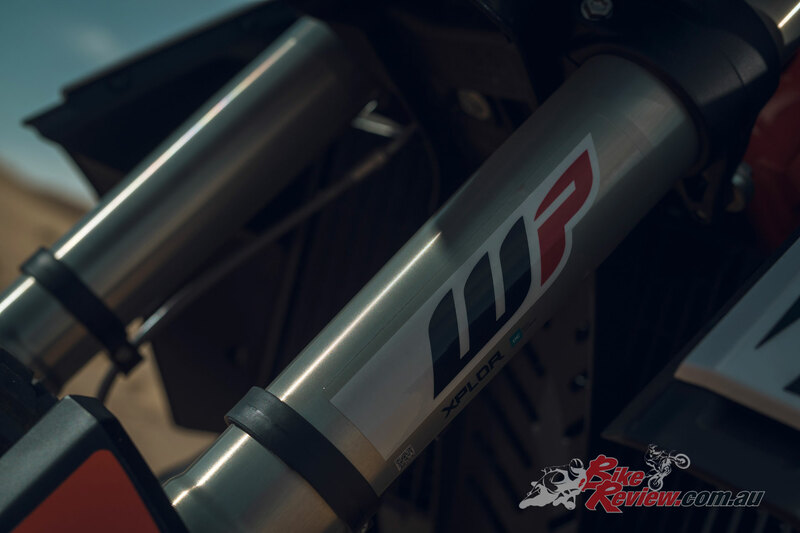 The two models’ key difference is their WP suspension. 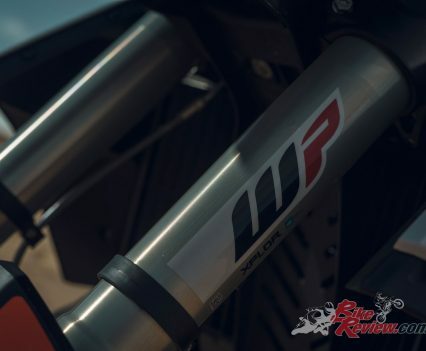 The standard bike has non-adjustable WP forks and a preload-adjustable shock, both with 200mm of travel, while the Adventure R gets more sophisticated, multi-adjustable units at both ends, each giving an extra 40mm of travel. 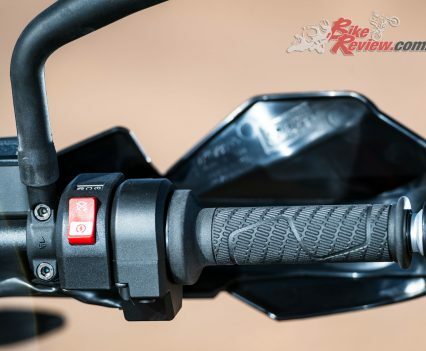 Those longer legs inevitably increase seat height, from the 830/850mm of the adjustable, two-part standard unit to 880mm for the one-piece R-bike seat, which can’t be adjusted. 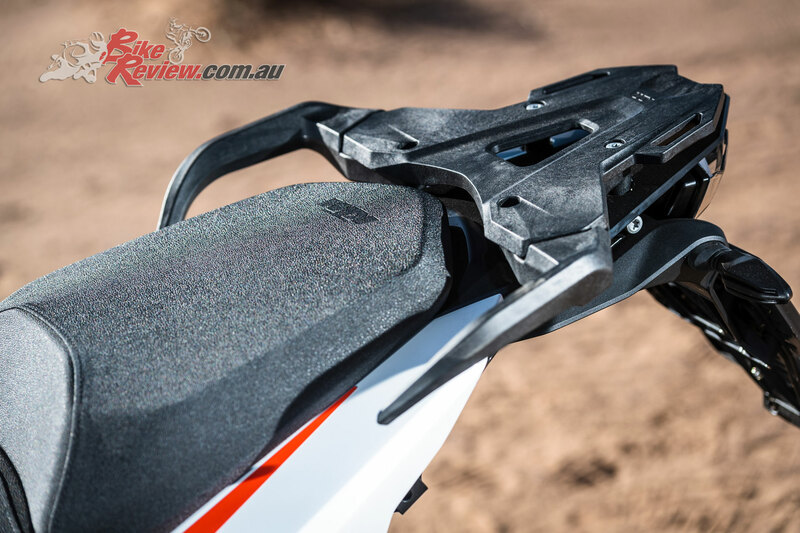 Other R-model differences are its shorter screen and taller front mudguard. 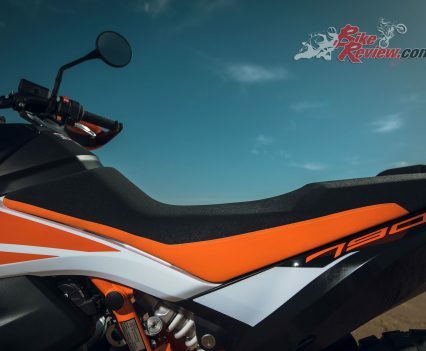 The R comes with Metzeler’s chunky Karoo 3 tyres, while the standard model wears road-biased Avon Trailriders on its identical, wire-spoked wheels. 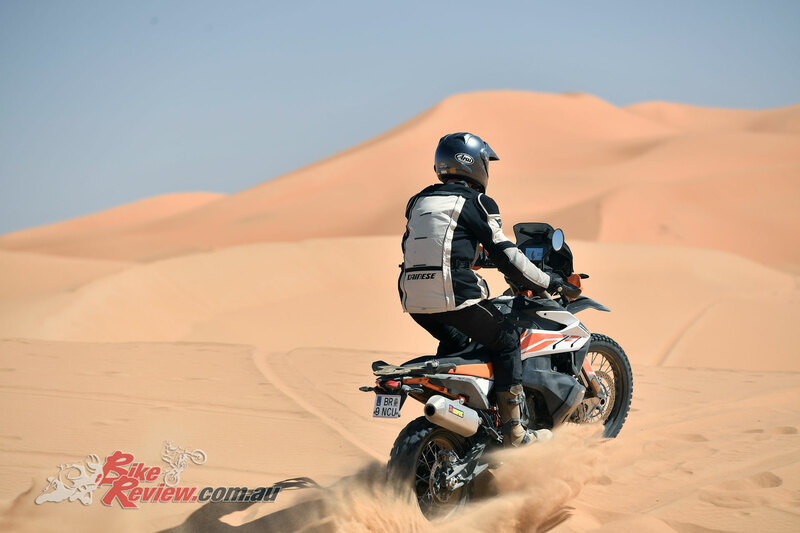 It’s more than a decade since the Dakar Rally was held in Africa, and a two-day press launch is a vastly different thing to that epic three-week race. 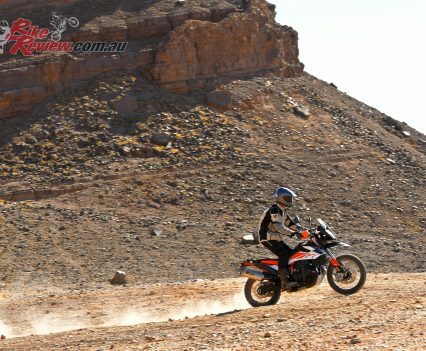 But that knowledge can’t prevent the spine-tingling feeling of excitement as, standing up on the pegs of an Austrian-built parallel twin, and gripping its bars behind orange hand-guards, I follow the KTM Dakar team’s manager and ex-rider Jordi Viladoms down a barely visible track through the vast, sandy expanse of Saharan sand. 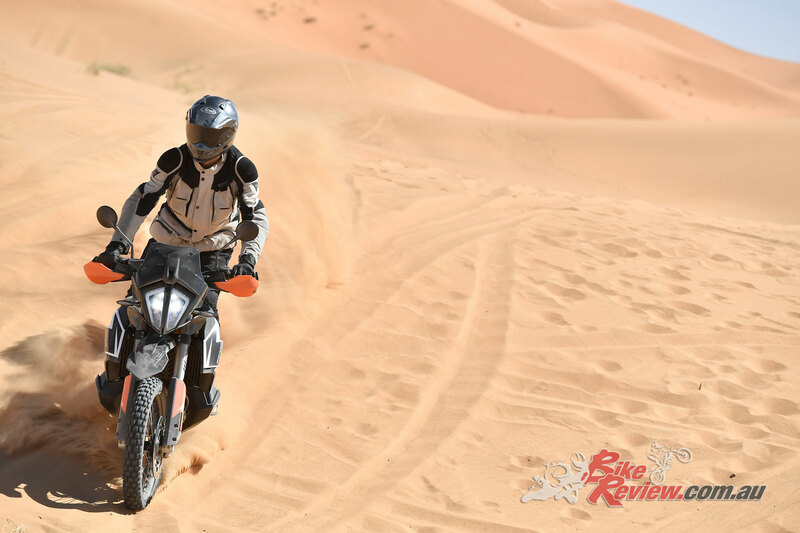 Earlier we were ploughing through the dunes, the going sufficiently tough that some riders opted out, and Jordi had to double back and help dig out a KTM that I’d buried up to its rear axle. 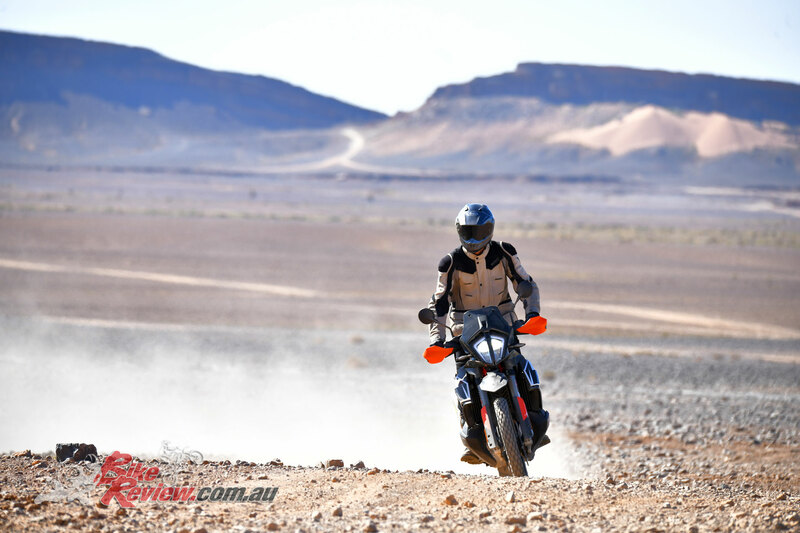 Now we’re back on much more open and faster terrain, gunning the 94bhp twin through sand and dirt at up to 110km/h, occasionally having to slow to maintain visibility as the rider ahead kicks up a bigger cloud of dust. 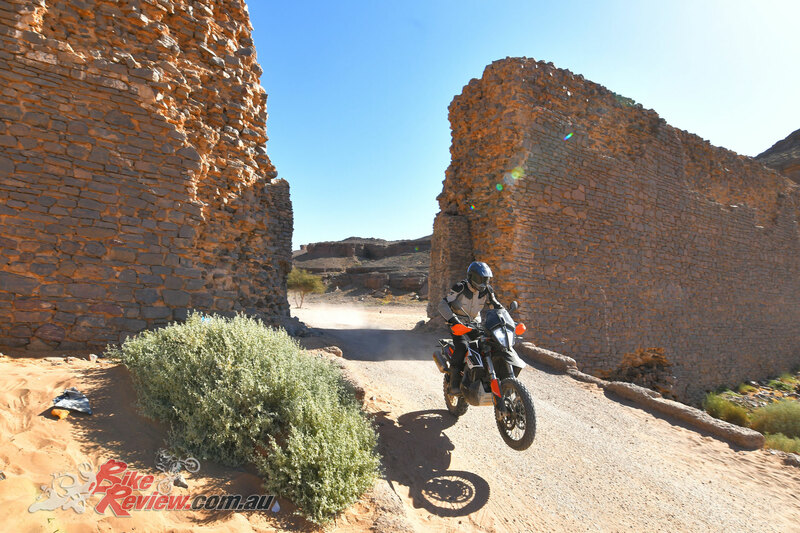 It’s exhilarating, often spectacular riding, on a bike that is by a distance the most accomplished I’ve ever ridden for the job. 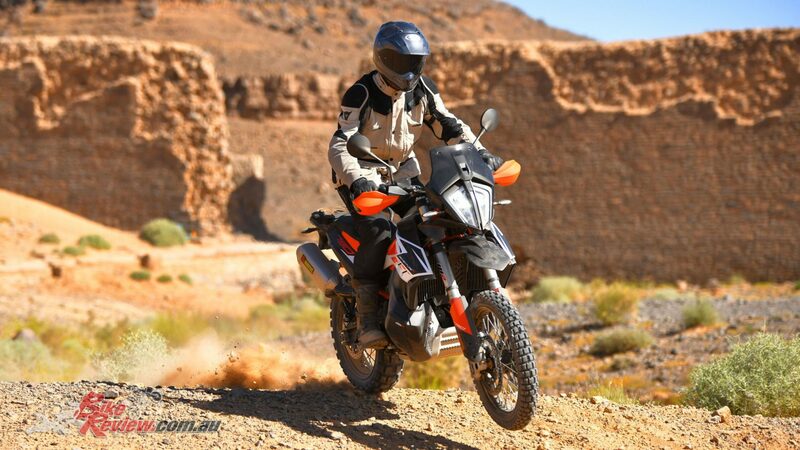 A bigger adventure bike would be fine, if less controllable, on this fast section, but I wouldn’t have got it through the dunes. 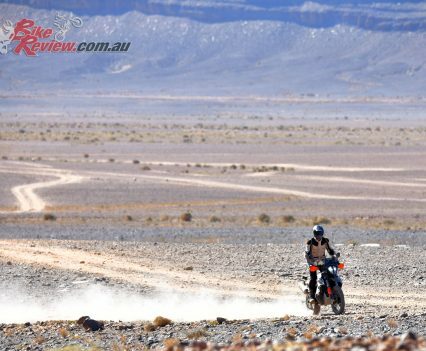 Smaller singles might have worked even better in the sand, but couldn’t have approached the 790’s pace or poise on the more open desert stretches, or on the road. 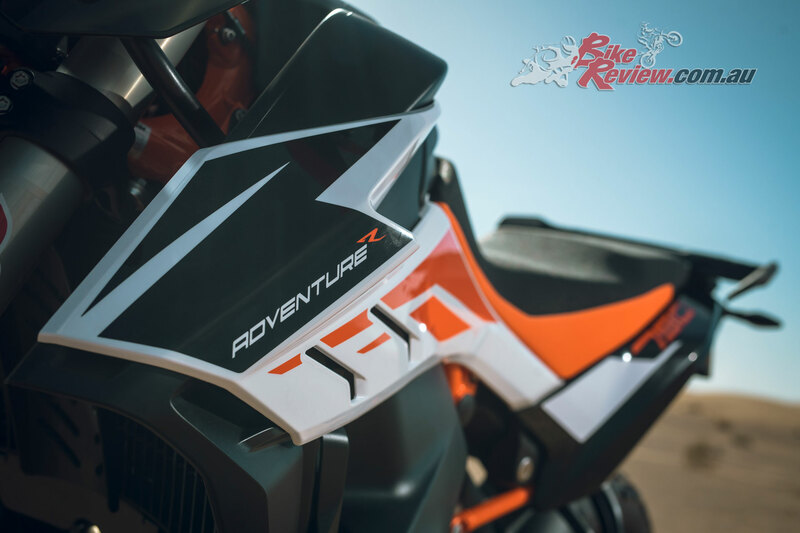 If there’s a key to the Adventure R’s competence on the faster off-road stretches it’s perhaps its blend of usable power, agility and thoughtfully fine-tuned ergonomics. 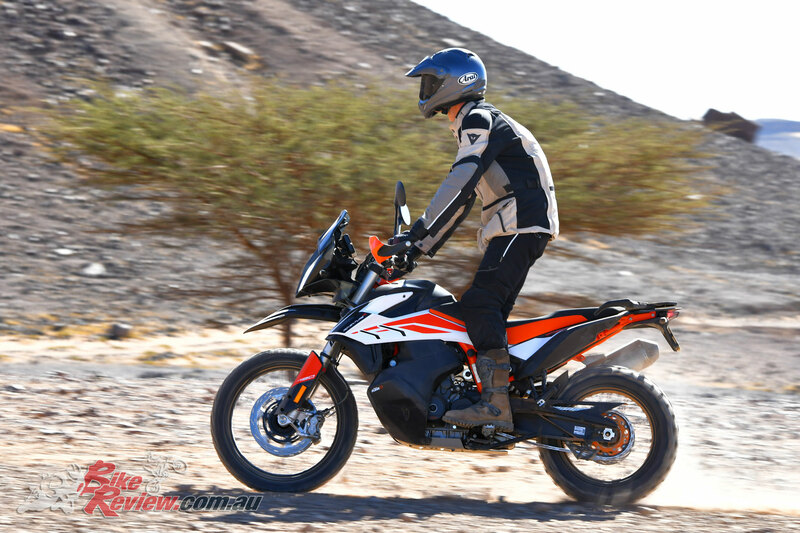 The riding position felt natural and allowed easy control although I’m very tall, helped by the slim tank and low centre of gravity (and the launch bikes’ wider accessory Rally footpegs). 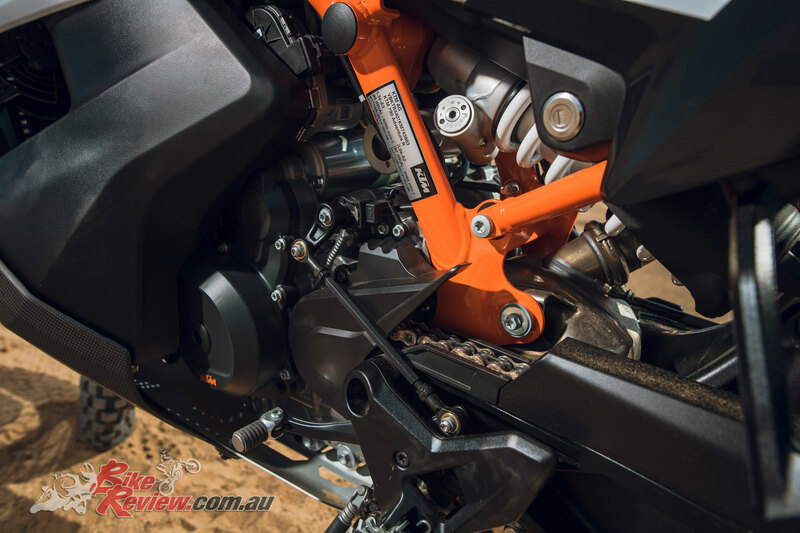 The engine always felt responsive and controllable, aided by a flawless quickshifter which, disappointingly, is an accessory even on the R, rather than standard fitment as on the Duke. 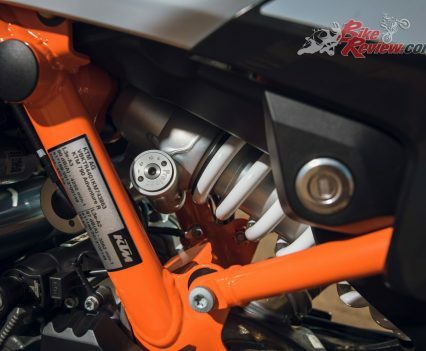 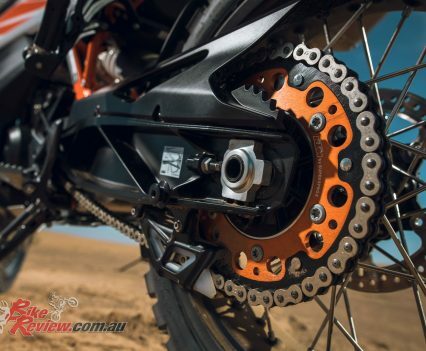 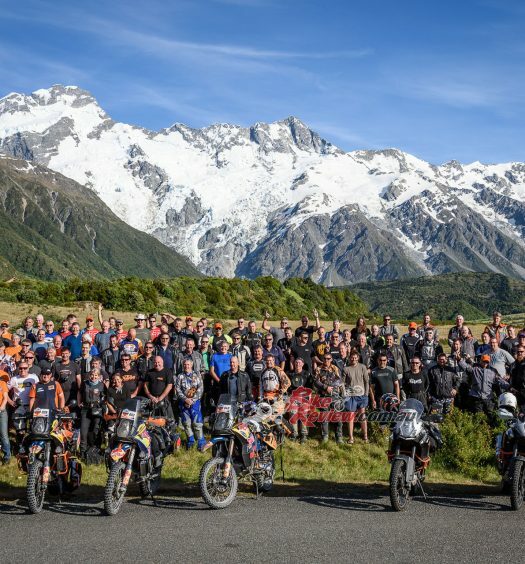 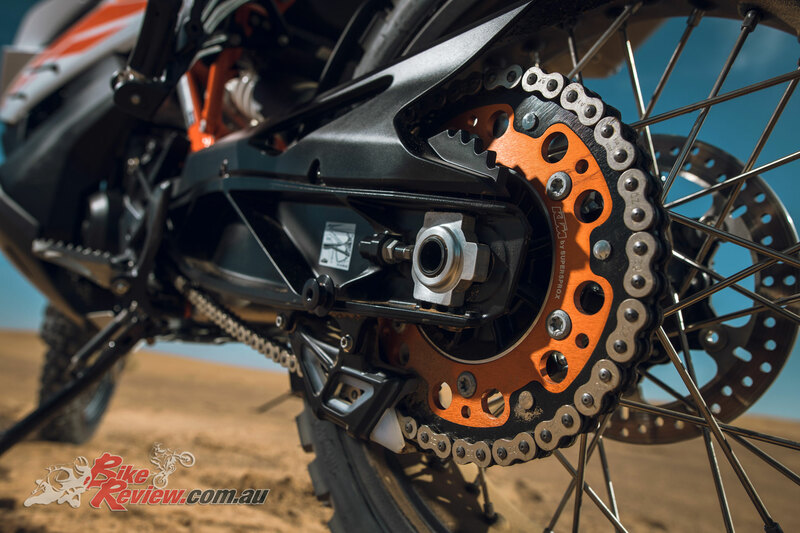 Perhaps the R-model’s most important asset was its suspension, which did an outstanding job on a wide variety of terrain, while maintaining the KTM’s sweet handling and stability, aided by a steering damper at the steering head. 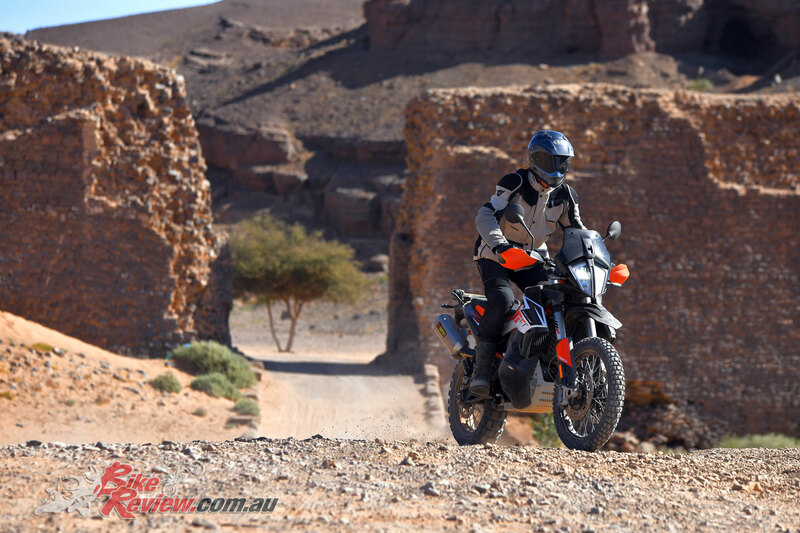 The bike felt taut on the road, despite that generous 240mm of travel at each end, and gave excellent ride quality despite being sufficiently firm to clout occasional rocks at speed, or land from jumps without bottoming out. 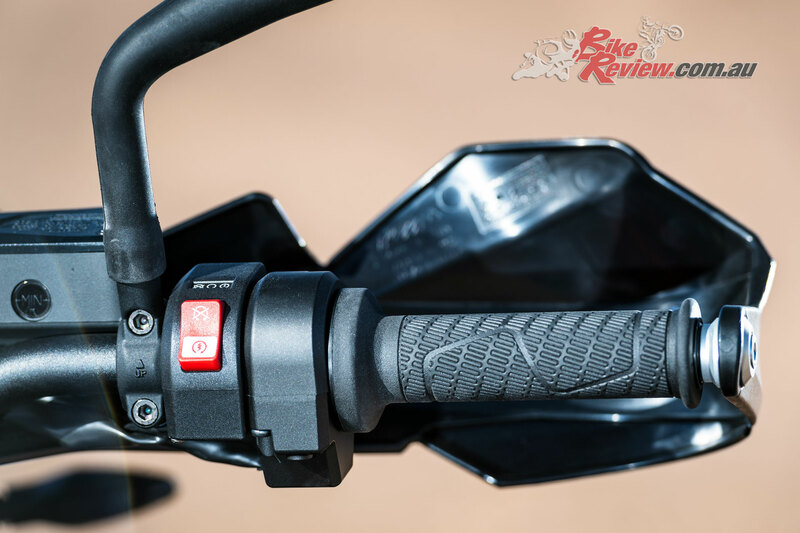 The electronics set-up is outstanding, too, notably the traction control that allowed even moderate off-roaders like me to power-slide the rear end in deceptively expert style. 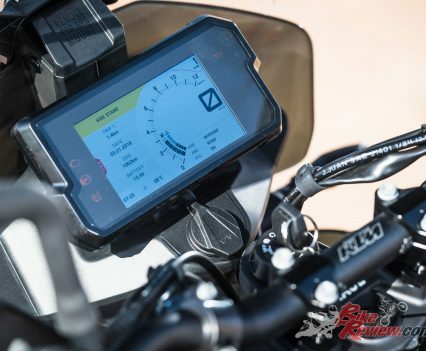 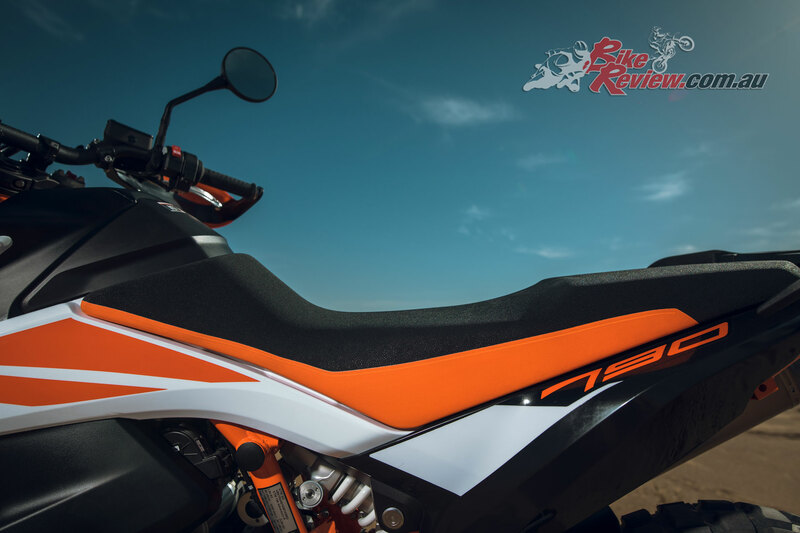 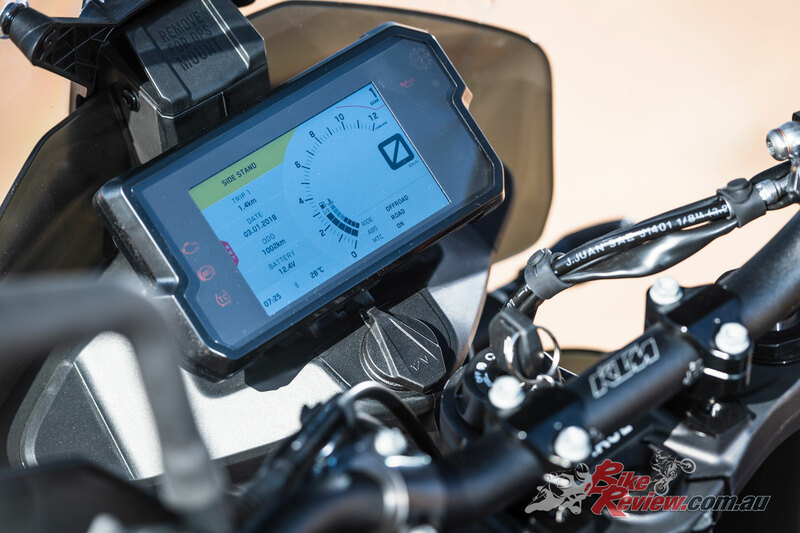 The Adventure R comes with a fourth riding mode, Rally, which is an accessory for the standard 790. 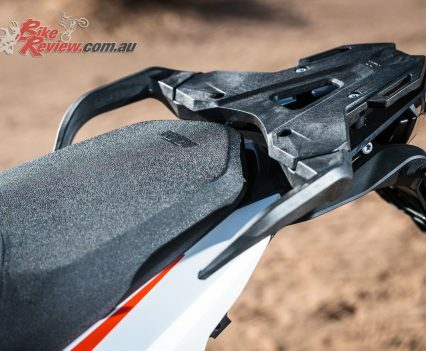 This allows traction control to be adjusted on the fly, through nine positions, via the button on the left bar. 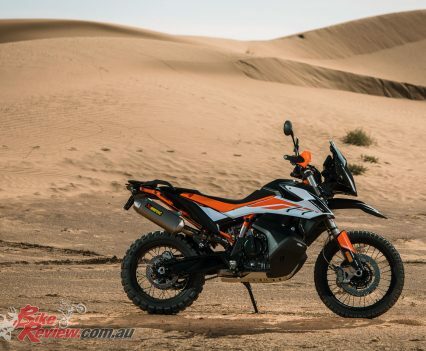 That was particularly useful in the desert, where Level Three or Four gave useful assistance on loose surfaces, but were no good in deep sand. 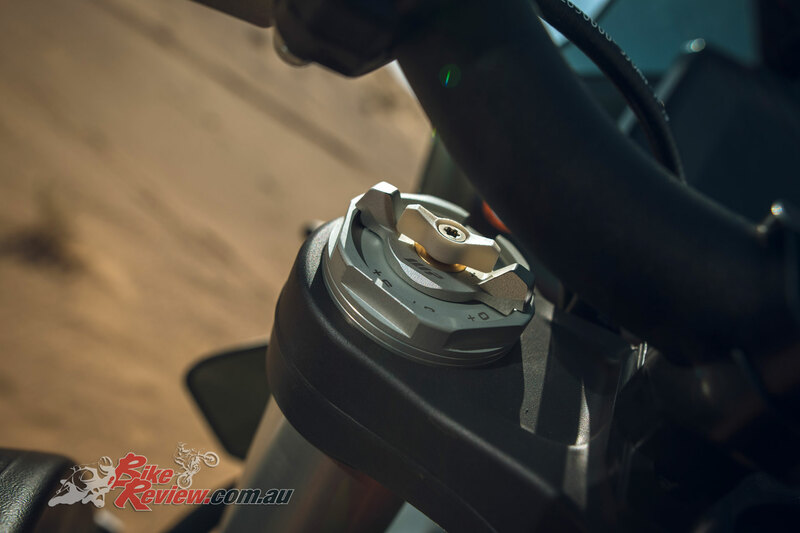 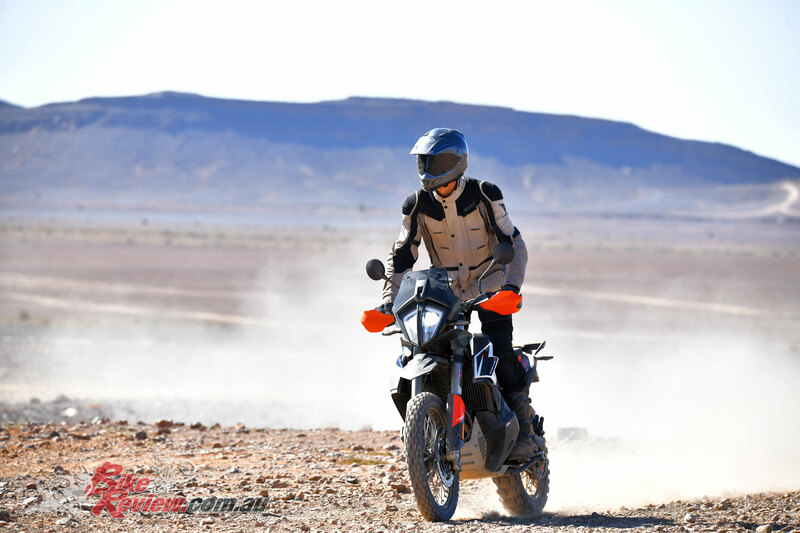 Quickly changing to the lowest – Level One allowed the rear tyre (knobby Conti Twinduro on the launch bikes, instead of the standard-fit Karoo) to keep spinning, giving the best chance of getting over the dunes. 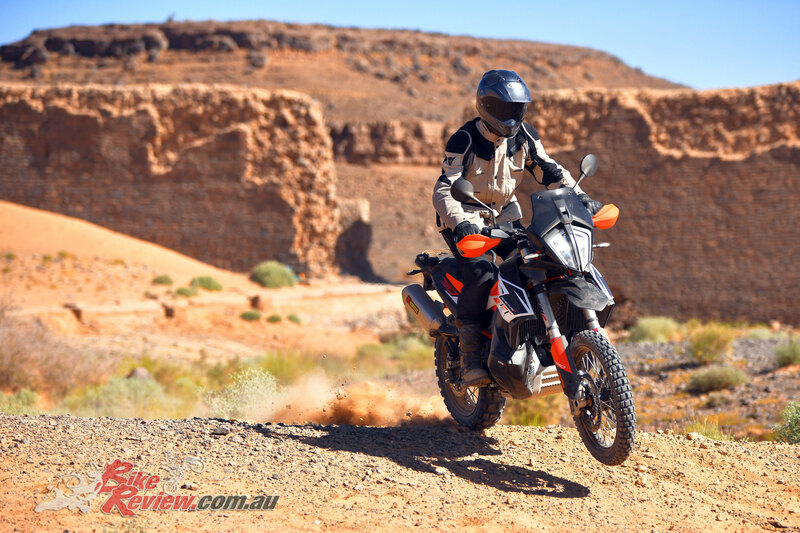 In some ways the R-model shone brightest in those tougher sections, where I’d have been struggling even more on other adventure bikes. 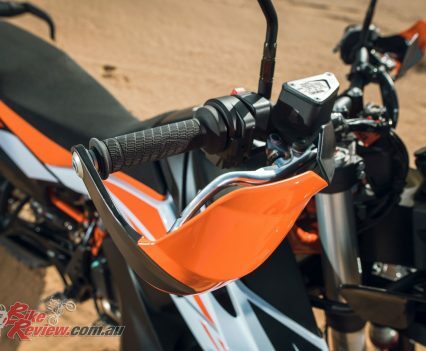 Picking up the 790, using a handlebar and the standard-fitment pillion handle, was relatively easy. 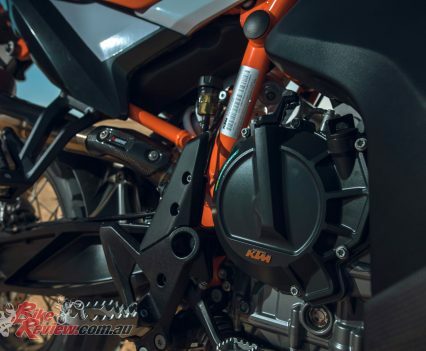 And its engine coped well with occasionally being revved hard at a standstill on a hot day, once giving an overheating warning on the dash, but making me glad that KTM’s development team had up-rated the cooling system with a bigger radiator and second fan following a tough Californian desert test midway through the project. 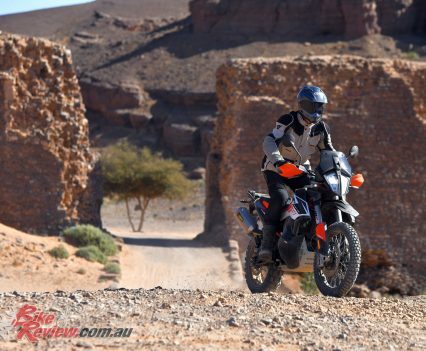 By the time we were back on tarmac and cruising back through the darkness of a Moroccan winter evening I was massively impressed by the Adventure R. For anyone looking for a machine for serious off-roading, as well as more everyday adventure-bike use, KTM’s super-middleweight is subtly better than the standard 790 and a distinct step up from just about anything else around. 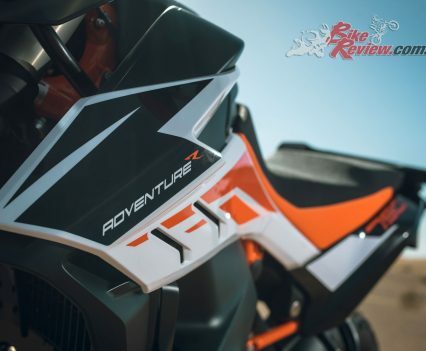 Perhaps the only real drawback with both 790 Adventure models is that they don’t follow the 790 Duke by springing a pleasant surprise when you get to the price. 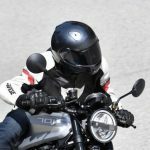 The standard model is over 25 per cent more expensive than the roadster (at least in the UK) despite lacking its quick-shifter; while the R-model is almost ten per cent more expensive again. 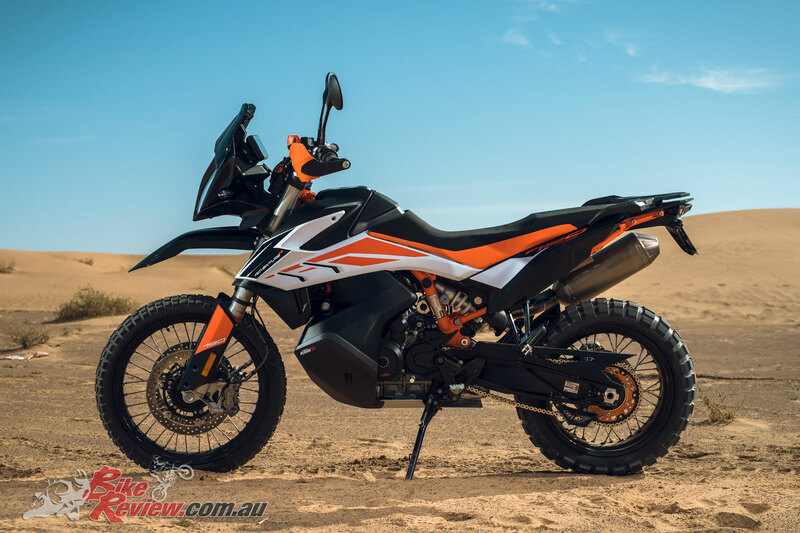 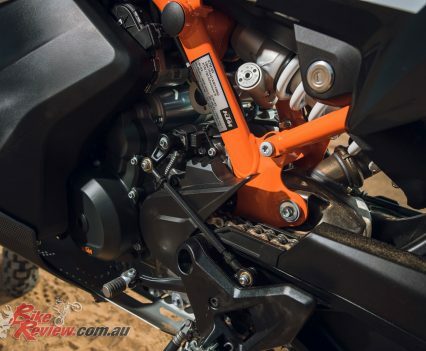 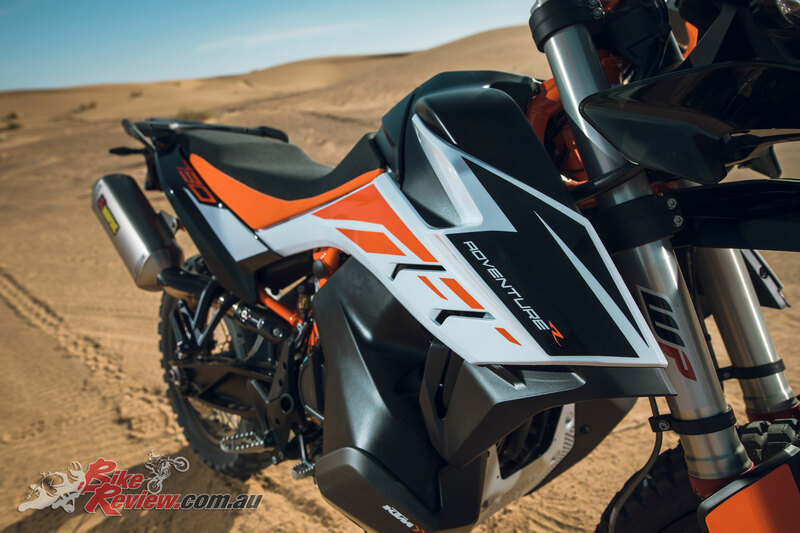 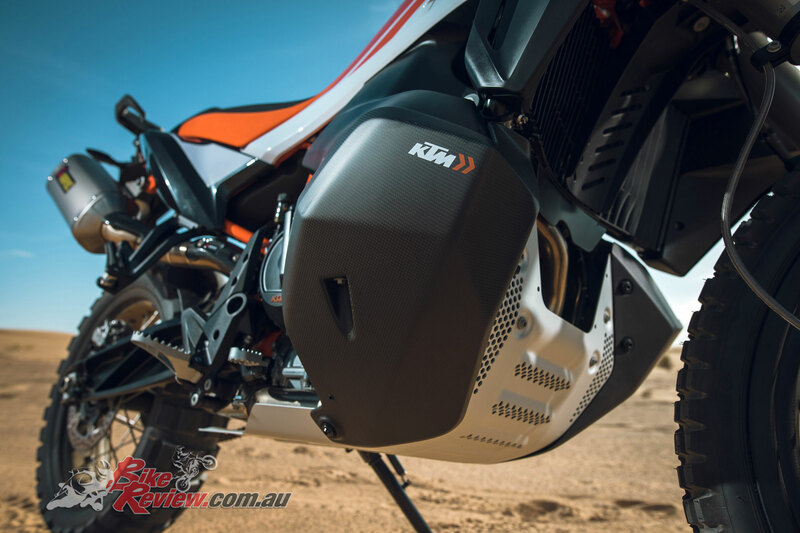 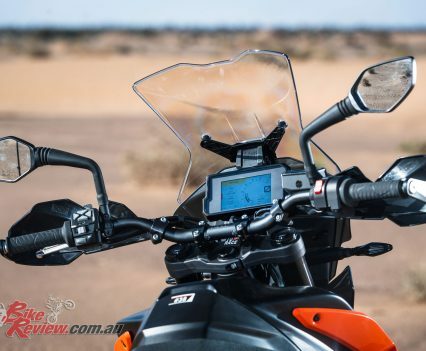 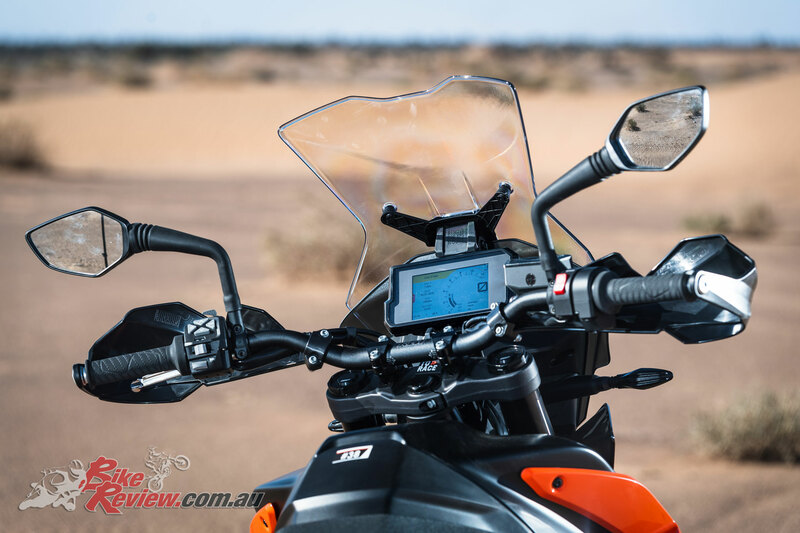 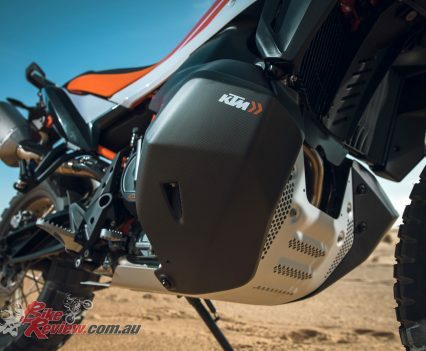 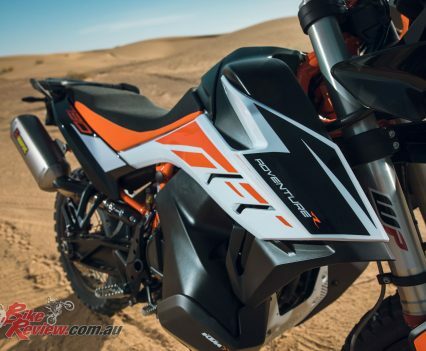 The KTM 790 Adventure models arrive in Australia for $22,695 ride-away for the R, while the KTM 790 Adventure will retail at $21,195. 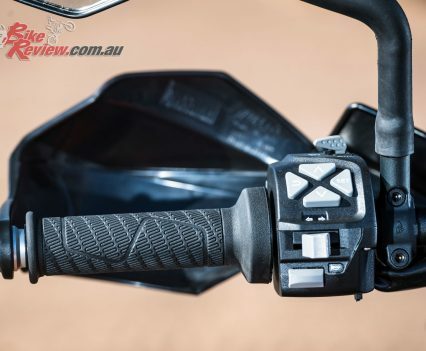 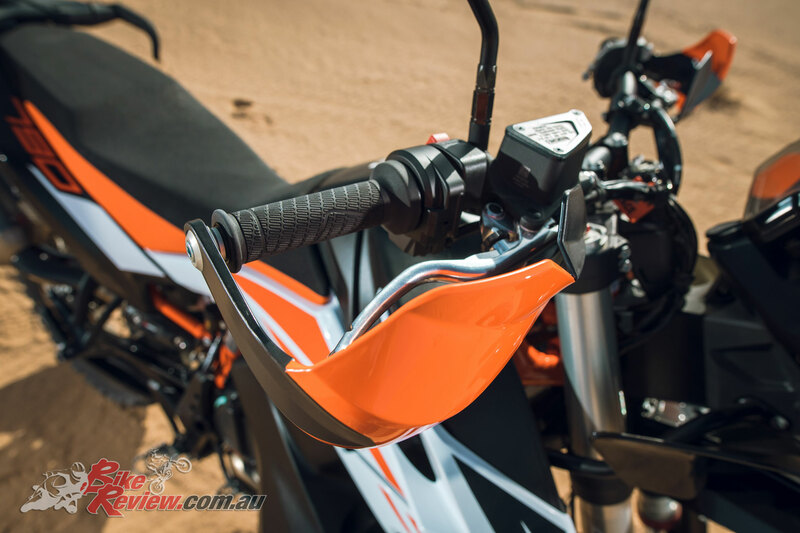 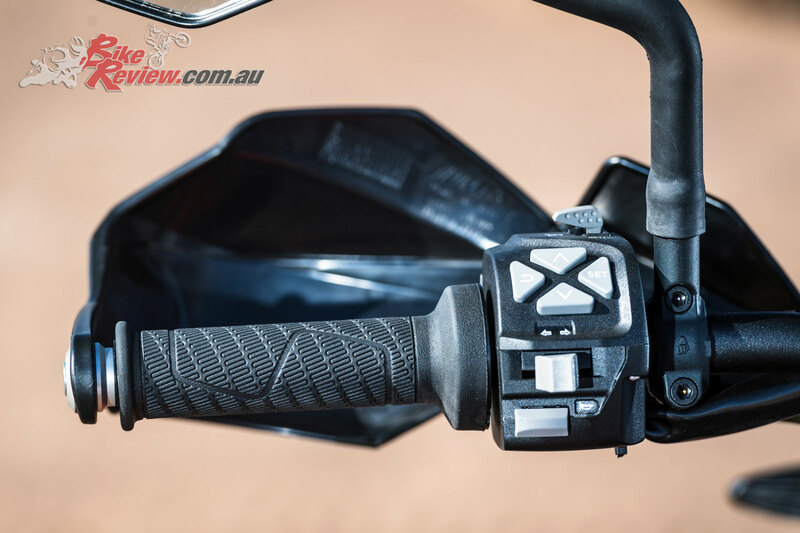 Fitting the launch Rs’ shifter, footpegs, tank protectors and Akrapovic muffler would bring the price to around that of BMW’s base-model R 1250 GS (from $25,890* Ride Away in Australia), a formidable if distinctly different opponent. 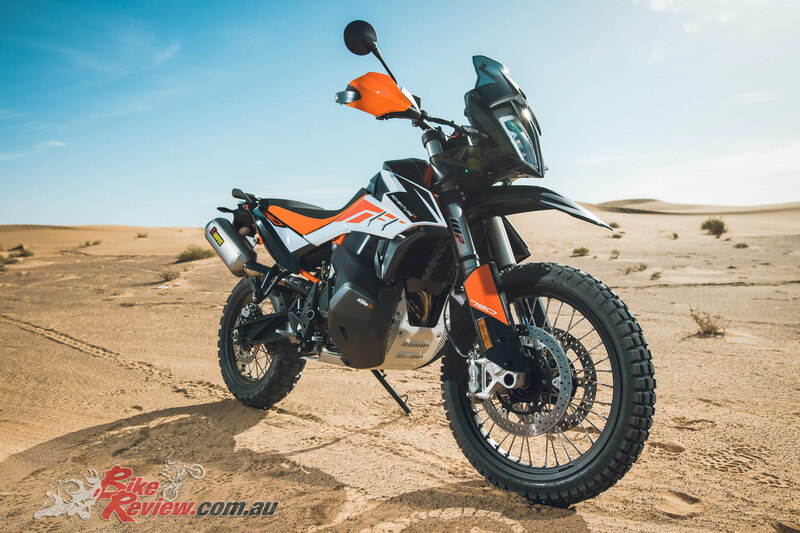 Those prices mean that the 790 duo, excellent as they are, might not prove the game-changers that their all-round abilities deserve. 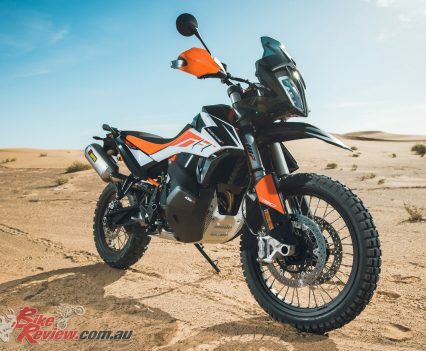 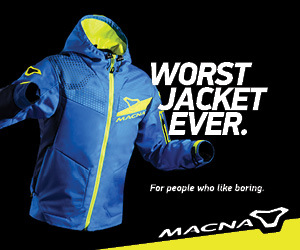 But they give the adventure class unique and appealing new options, and for serious off-road riders they’re arguably the best bikes regardless of capacity.